What's new in Dotnetnuke v7? DNN 7.0 makes creating and managing content-rich websites, social intranets and online communities easier than ever, with benefits for web content editors, enterprises, web designers and web developers. It's the easiest to use version and provides new features to make you more productive. DNN 7.0 is also the most advanced development framework to date, allowing you to build powerful web applications. With support for Active Directory and SharePoint Lists, DNN 7.0 can also be seamlessly integrated with popular enterprise applications. DotNetNuke 7.0 includes a brand new control panel for managing your site. Each menu has been updated to offer a more intuitive experience. We've even made it possible for end users to personalize the menu by creating their own bookmarks within the menu. The Host and Admin menus include areas for common items, advanced items and personal bookmarks. The Modules, Pages and Users menu items provide quick access to common features in those areas. Navigating page-by-page while in edit mode has never been the most efficient way to navigate a DotNetNuke site. Edit mode increases the overall page payload and browser rendering. In DotNetNuke 7.0, users are now always in View mode.The Edit Page menu gives the user the ability to quickly toggle edit mode along with providing quick access to common page tasks. DNN 7.0 has View Mode as the default view for all users. You can also choose to select "Stay in Edit Mode" which switches the default view to edit mode. The default View Mode improves page rendering and response time for general purposes. DotNetNuke 7.0 brings back Drag-n-Drop and it's better than ever You can now drag modules between panes and from the control panel to a pane while in edit mode. For DotNetNuke installs with multiple sites, there is a fairly common need for the ability share content across different sites. In DNN 7.0 Professional and Enterprise Edition, you now have the ability to share modules across multiple sites within the same DotNetNuke instance. Sharing the HTML module is very simple. Just choose "Add Existing Module" from the Modules menu then select the site that contains the module you would like to share. 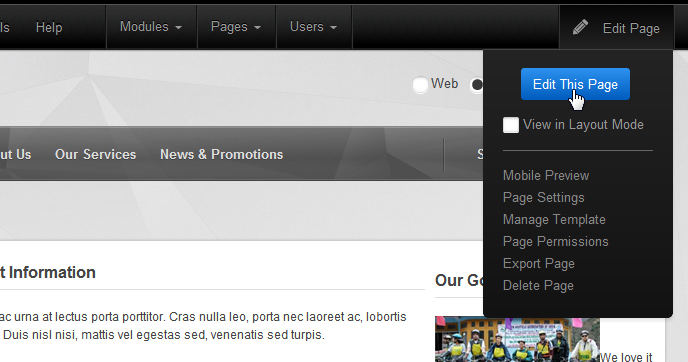 Next, choose the page where the module exists and you will see a list of shareable modules come sliding across. In DNN 7.0 the Manage button has been removed in favor of a new approach that will provide greater consistency with skins. The Manage button has been replaced by the Actions menu that properly separates common module tasks. You will see three icons that represent Edit, Manage and Move. The Edit menu will be used for module defined actions. The Manage menu is used for settings and admin tasks. The Move menu is used to move a module between panes when drag-n-drop isn't available. Have you ever been working on a piece of content and have your browser crash? Maybe you thought you were trying to clean up a few browser windows and accidentally closed the wrong window. If you have been a victim of lost HTML work you will love the new auto save feature. Simply enable the Auto Save option from the HTML Module Settings window and you'll manage content easier knowing that your hard work is being saved in the background. Have you ever wanted to know what changed in a piece of content between versions? DotNetNuke makes it easy for you to keep track of multiple versions of your content, but now we have made it even better! 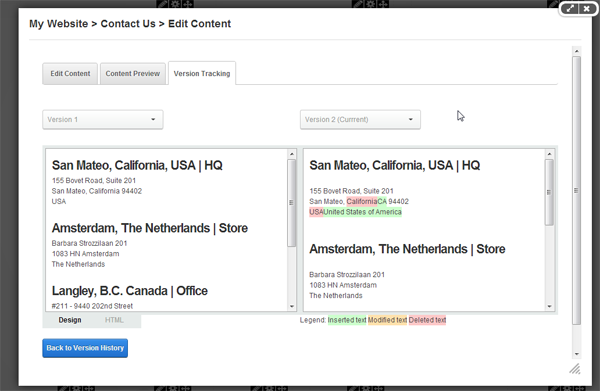 With Version Compare, you can easily see the difference between each stored version of content. You can choose to highlight the actual text changes, or for those that want even more detail you can switch to HTML view and see the actual code that was changed.